How leaders believe things should get done is a key driver of culture. Leaders establish culture consciously, or unconsciously, through their own personal motives and actions. Leaders care about what it takes to succeed, and their perception of those needs will impact their behaviours and expectations. External forces can forge culture change, also. The most obvious external impact today is technology. Nothing is going to impact how we behave more than the current transformation brought on by the internet, unified communications, collaboration tools and other advanced forms of technology emerging in our homes and workplaces. In the UK today, huge spending cuts are transforming the Public and 3rd sectors, forcing these organisations, some for the first time in living memory, to make radical changes to work practices and their interactions with the public. The result of this new pressure is that government leaders are coaching and teaching their people to run their programs competitively, measure results, build business cases for change, plan strategically, create customer value and so on. 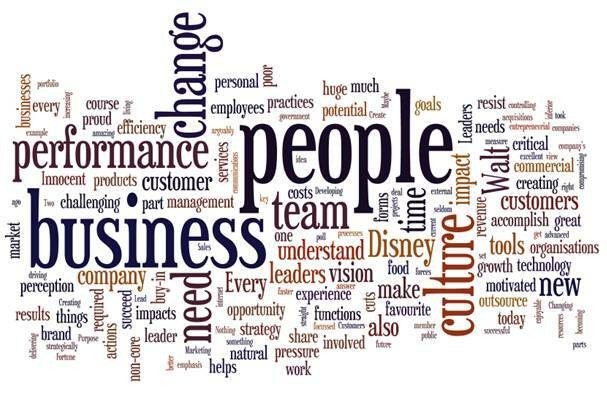 There are clearly impacts on the culture, and therefore, the management systems and practices. Culture provides consistency for an organisation and its people, a critical need in organisations where leaders change due to the marketplace, mergers and acquisitions and down-sizing. Knowing ‘what matters around here’ and ‘what I do is important’ helps people feel they are working with some stability and predictability in a changing workplace. Since the idea of change being constant is becoming more and more evident, people need help in understanding the vision and their part in it. They also need to be involved in making the change happen. At KC we’ve invested huge amounts of time and energy involving our people in our vision and values and this is not a one-off activity. Every member of every team needs to understand and be engaged in your vision, understand how they can contribute to it and what support they’ll have in getting there. Two of my favourite brands are Walt Disney and Innocent. Just read a couple of their ‘Corporate’ statements to understand culture and what sits at the heart of these very successful businesses. Changing a culture in an established business as opposed to creating one in a new business is arguably much more difficult. Maybe that’s the shift in mindset required – collaborating on creating a new one could be a better course of action! Every business leader that I’ve met faces this challenge and at a detailed level the actions you take as a leader will be different dependant on your business market, your product / service portfolio, your position in the market and the cost profile of your business. Developing a cost-reduction strategy that maximises efficiency without compromising growth potential is not straight forward. You have to resist pressure to make indiscriminate cuts or slash headcount across the board. You need to identify core competencies where efficiency can be improved, trim and consolidate non-core functions, and reinvest the savings in critical business assets. And before you start, you need buy-in from your employees, especially those in senior and middle management. Outsourcing might seem to be an easy answer. In many industries, contracting out non-core business functions such as human resources, billing, or payroll to third-party providers is gaining acceptance. Many companies outsource parts or all of their operating processes. But once a company decides to outsource, it also exposes itself to new forms of risk. For example, an inferior supplier of outsourced services can, overnight, inflict lasting damage on a company’s relationship with its suppliers and customers, that is to say its brand. I’ll keep it really simple. Focus on delivering the best possible experience you can afford for your customers at every stage of their time with you. Every interaction a customer or potential customer has with your brand is an opportunity to change their buying perception of you. Customers can share information about your products and services in a ways unimaginable 10 years ago. Fortune 500 and FTSE businesses have seen >10% share impacts of influential customers through social networks – Positively or Negatively. I’ve listed a few thoughts below, but read Gung Ho! if you really want some great insight into employee motivation. Involve them – when people are involved in fleshing out visions, plans and projects, they buy-in faster and resist less. This means you can implement the change(s) more quickly and easily. Set challenging goals. My experience has taught me that people strive to achieve what is expected of them. If you set challenging goals your team will work hard to accomplish them, providing of course, they are realistically attainable. It is amazing what people can accomplish when they are given the opportunity to perform. Communicate – Your people need and want regular updates on the progress of the business and their personal performance. Talk to your team members regularly, letting them know if the business is on / off track. Celebrate individual and team performance. Catch people doing something right and focus on recognizing excellent performance. Give people the tools to succeed. No team will stay motivated if they do not have the necessary tools required to do their job. Manage poor performance. While poor performance and conflict are seldom enjoyable to deal with, you have a responsibility to your team and the company to manage it.